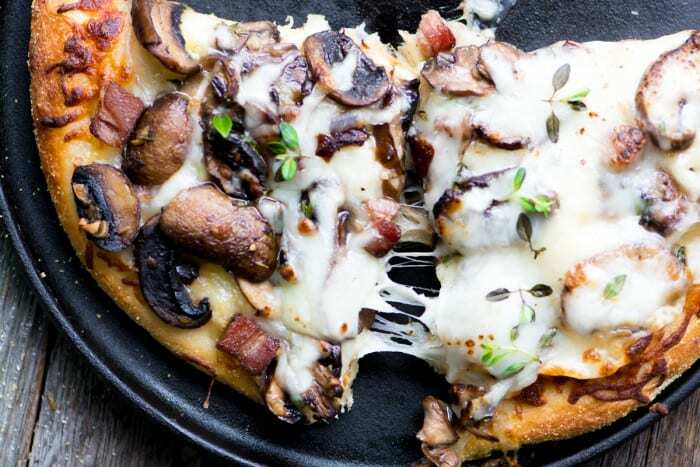 This Quick Mushroom and Ham Pizza is a warm and cozy pizza that you can whip up on a whim because it’s made with…wait for it…refrigerated dough! I’ve never tried pizza dough in a tube, and I was curious about it, so I picked one up the other day at the supermarket just for kicks. I don’t make a lot of pizza at home, mostly because I forget to plan ahead for the whole yeast rising thing, so while the canned dough isn’t on a par with homemade, it turned out pretty good, and I like the idea of being able to whip up pizza on a whim. It also frees me to concentrate on the toppings, which is fun, I look forward to getting more creative with my next experiment! The first thing I realized is that the dough comes out of the tube in a big (cold) rectangle (duh). I wanted a round pizza, so I brought it together into a ball by folding it under itself a few times. Then I let the cold dough rest under plastic for about 15 minutes, just to let it relax so I could roll it out more easily. If you try to roll it while it’s cold from the fridge it won’t cooperate. 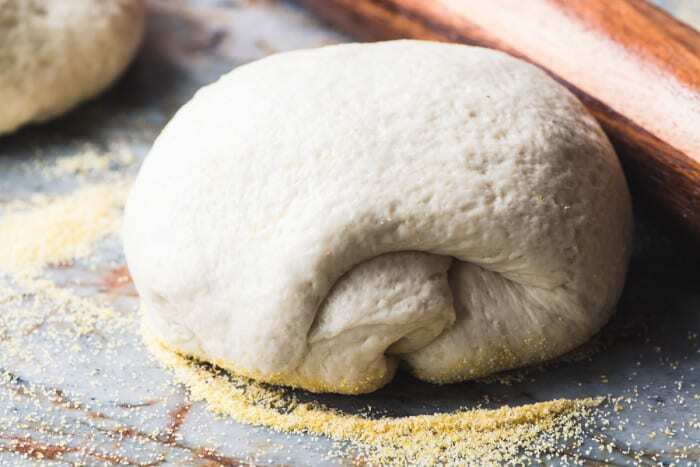 Pizza dough, whether homemade or from a can, is elastic by nature, so if you have trouble getting it to keep its shape, let it relax a little longer. You have to play with it a bit. TIP: If you’re not into fighting with the dough to make it round, just leave it as a rectangle. You will probably need to reduce the cooking time. I rolled the dough out to a 10- inch circle to fit my pan, but you can take it to 12 inches if you like a thinner crust. Place the dough on your pan, and then make dimples all over the dough with your fingertips. 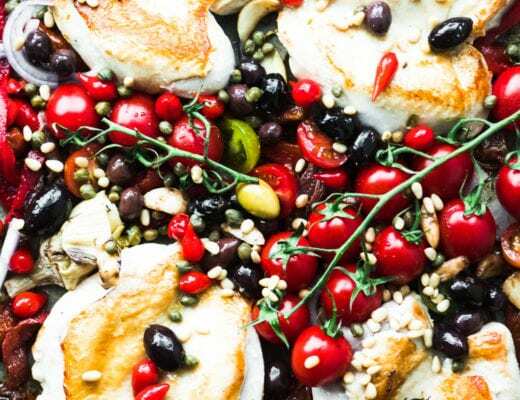 I drizzle the surface with olive oil, and then arrange my toppings. This one is a ‘white’ pizza, so no tomato sauce required. TIP: The ham added a ton of flavor to this pizza, I highly recommend it! This makes enough for 4, and you can cut it in fat or thin slices. It’s best hot from the oven. Unwrap the dough and form the rectangle into a ball by turning the edges under until it becomes a smooth round shape. Set it on a surface that has been dusted with cornmeal, cover with plastic, and let rest for 15 minutes. 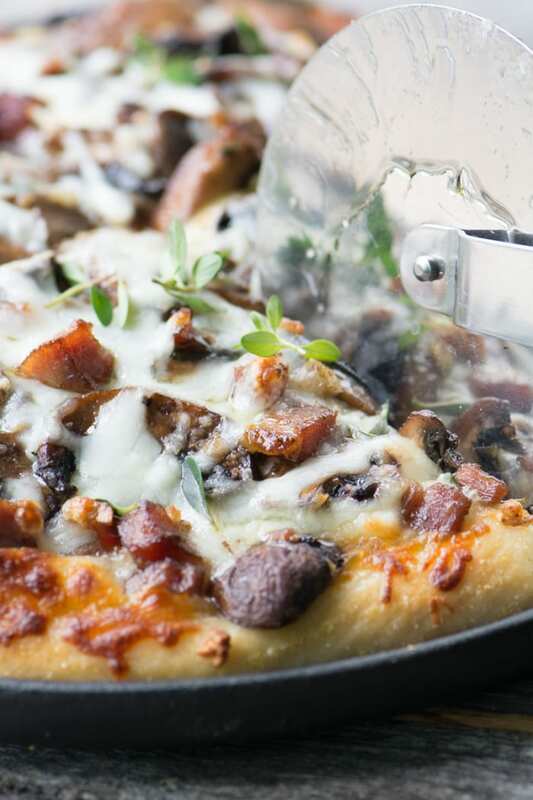 While the dough rests, heat 2 tablespoons of oil in a skillet and saute the mushrooms, garlic, ham and thyme until the mushrooms are browned, about 10 minutes. Roll out the dough to a 10 inch round and transfer to a pan or baking sheet. If you like a thinner crust you can roll out to a 12" round. Make dimples all over the dough with your fingertips and drizzle lightly with olive oil. Lay down a layer of cheese, and then add the mushrooms. I usually add a little more cheese over parts of the mushrooms, leaving at least half of them showing. Bake the pizza for about 20 minutes, or until the crust is golden browned and everything is melted and sizzling. Serve right away. 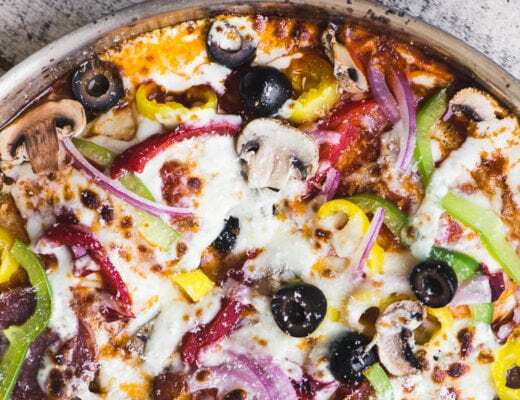 Don’t overload your pizza with too many toppings or the crust won’t get a chance to cook through and may become soggy. Be sure your oven is at the right temperature, pizza dough needs a high heat to cook properly. 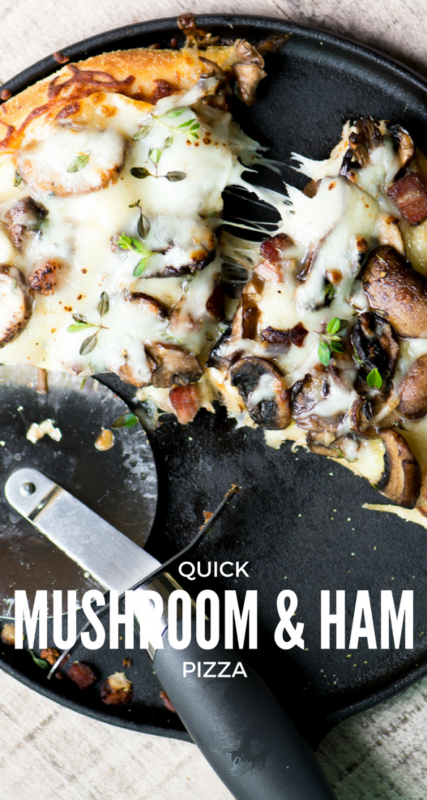 Don’t forget to pin this quick and easy mushroom and ham pizza! 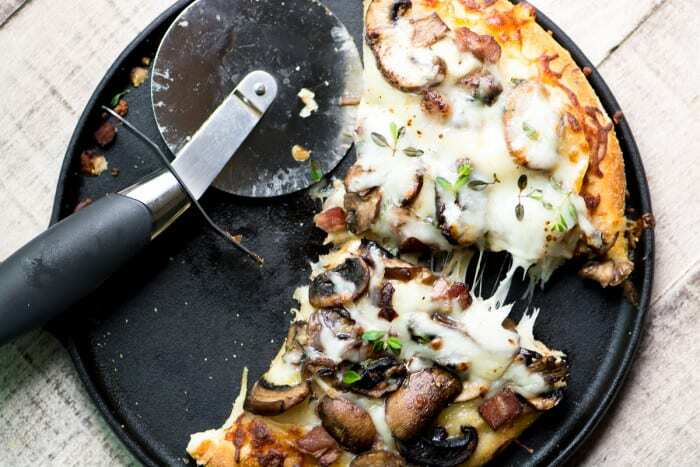 After I make a batch of your weight loss soup, this pizza is up next – it looks fab! We love pizza! Delicious and spur of the moment is always welcomed !! That pizza looks amazing! Wish I could have a wedge for breakfast! The flavors look just delicious in this pizza and refrigerator dough? I use that too! I love your tip to leave the dough on the counter to rest, I did not know that and will keep that in mind for next time – thank you! Yum! This pizza looks heavenly! I would love a slice right now! This looks super yummy! I have mushrooms just waiting to be used. Can’t wait to try this out! I think this is most useful for families with kids, Katie, I wish I’d experimented with this when my kids were young…we had WAY too many of those awful frozen pizzas. This looks amazing! I don’t think I’ve ever tried premade refrigerated dough before. 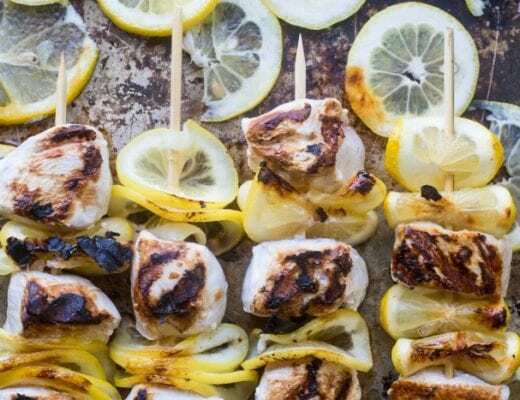 It seems like a super convenient way to get dinner on the table fast, and it ended up looking great! 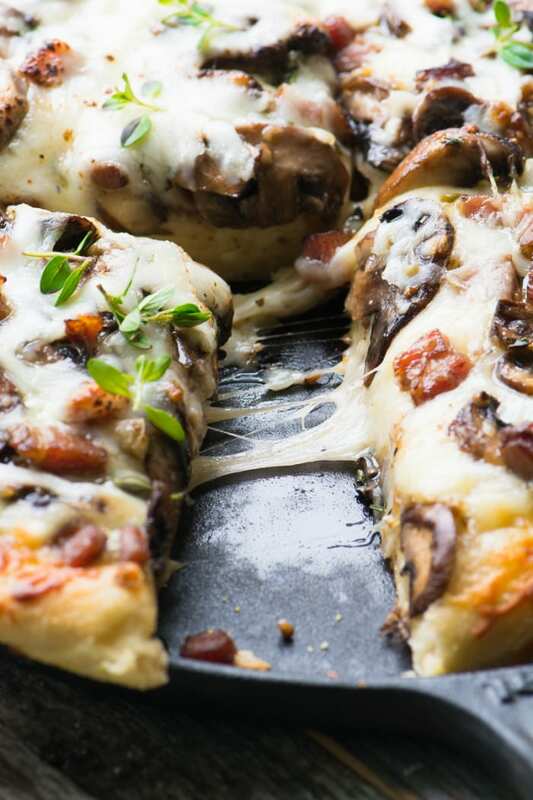 I love a good pizza like this, especially one with mushrooms! I think we could eat pizza every day! Oh be still my heart! I adore pizza, and mushrooms, and well cheese too, and this would have been perfect with our leftover ham … if I had anymore! A beautiful pie Sue – thanks for making me hungry! I just happened to have a sliver of leftover ham, but pancetta or bacon would work, too! I just had lunch and you’re making me hungry! I love the idea of a really easy, spur of the moment pizza.